Right about now you're sitting beside a bag of candy trying to decide if you should eat more than you've already had or walk away from the bag and go to bed. You may not have gotten as many trick-or-treaters as you hoped for and are now stuck with sweet and chocolaty temptation. If this sounds like you, here are a few delicious things to do with those leftover candies! 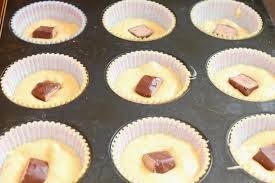 Fill up your cupcake tin with your favorite vanilla or chocolate batter. 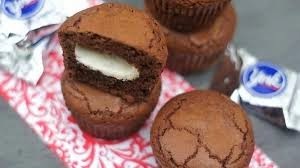 Submerge a piece of candy into the center of each cupcake OR chop up pieces of candy and mix into the batter. Bake for 17 minutes at 350 degrees and serve warm. This is perfect for candies like Snickers, Turtles, Payday and Babe Ruth. Bark is one of those lovely creations that allow you to create your own recipe as you go. Start off with melted chocolate (melt dark, white or milk chocolate over a double boiler). Lay a piece of parchment paper over a sheet tray or large pan. Carefully spread your chocolate out onto the pan. 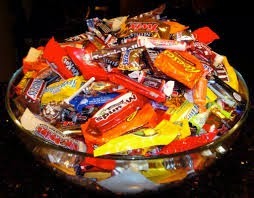 Generously sprinkle any candies you'd like over the chocolate. Allow to set and harden for at least an hour. Place in the refrigerator. When fully hardened, break into pieces and enjoy. You can also purchase treat bags (or sandwich bags) and leave them out for guests to enjoy. Start off by baking a two or three layered cake. Stack and fill the cake as you normally would with a frosting of your choice. Laying a few pieces of small candy between each layer wouldn't hurt. Next, cover the cake in a layer of frosting. If using kit kat's, break off two at a time and place around the perimeter of the cake. The frosting will act as a glue. Keep doing this until you've met back with the first two Kit Kat's. None of the frosting should be showing through the kit kat's. Refrigerate for at least 15 minutes to let them set. 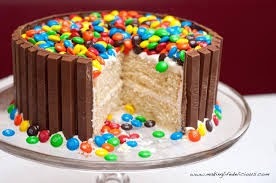 When ready, cover the top of the cake with M&M's or Reese's Pieces. A more elegant option would be to pipe swirls on the top of the cake using a star tip. 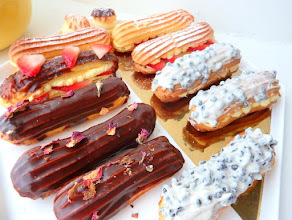 The same directions would apply to any other log shaped candies and cookies such as Butterfingers, Twix or Lady Fingers. 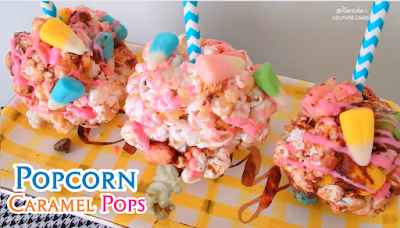 Here is a frozen treat that will remind you of your favorite ice cream pop. Cut a few banana's in half and insert a Popsicle into the cut end. Freeze the banana's for 30 minutes. Melt the chocolate of your choice and place in a large mug. Chop up a few peanut butter cups and set aside. Remove your banana's from the freezer and dip them one by one into the chocolate then immediately sprinkle with the peanut butter cup. 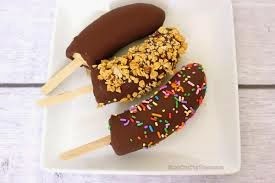 The half frozen banana's will allow the chocolate to set faster and hold its' shape. Place on a piece of parchment paper and freeze for 1 hour. When ready, take a bite and fall in love. 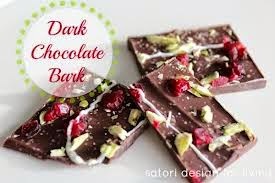 For a complete healthy treat, use dark chocolate to dip and raisins instead of peanut butter cups. Yes Halloween is considered to be over but that doesn't mean you can't make a spooky treat out of remembrance. Start by crushing up a few Oreo or chocolate cookies. I like to use a sandwich bag and rolling pin for this step. Grab a few clear plastic cups and cover the bottom with the cookie crumbs. Fill the cup with chocolate pudding (boxed or homemade) and top with the rest of the cookie crumbs. 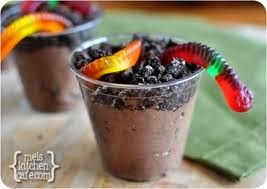 Lay a few gummy worms on top and voila! Wrap the cups in plastic wrap and tie at the top to turn into party favors. In a blender start with 2 large scoops of vanilla ice cream and a splash of milk. Before blending add 1/4 cup of SweeTarts. 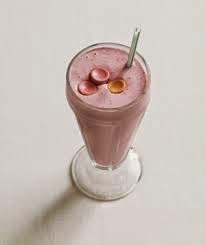 The milk measurement will depend on how thick or thin you prefer for your milkshake to be. Blend for 2 minutes or until completely smooth. Pour into a cold glass and garnish with two SweeTarts. A homemade trail mix is almost a guaranteed ticket to tasty town. You can't go wrong as long as you've got what you like. By no means am I saying to add the kitchen sink. But, this one is quick and easy. 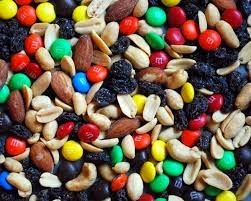 In a large bowl add dried fruit, nuts, chopped pretzels, broken pieces of chocolate bars or chocolate chips and candy corn. Take it a step further by adding a classic: Spread a cup of Chex Cereal onto a sheet tray and bake for 10 minutes at 350 degrees. Drizzle with honey or melted caramel and toss with the other ingredients. I think most of you can agree with me that the best Jolly Rancher flavors are watermelon and green apple. Imagine being able to drink those flavors. Ugh so good. Okay, here's what you'll need: Boil about 4 Cups of water and add 5 watermelon Jolly Ranchers (or flavor of your choice). Remove the pot from the heat and add 3 tea bags (black tea). Allow for the tea to steep and the candy to melt for about 15 minutes. Slowly stir in your desired amount of sugar (or leave only sweetened by the candy) and refrigerate for 2 hours or until cold. There comes a time (usually when it's not cold out) that I enjoy the classic chocolate covered mint combo. These brownies are sure to make you melt and open your nasal passages at the same time. LOL, I CAN'T! Okay, start off with a box of your favorite brownie mix or be a super baker and make the batter from scratch. Simply spread half of the batter onto your greased pan and lay the peppermint patties over the batter leaving about an inch of space between each one. Cover with the rest of the brownie batter and drizzle with melted chocolate. Add about 5 minutes to your baking time, cool and slice. Aaahhhh that chocolaty winter chill. When in doubt...go the other route. Grab a bowl, grab your candy and be prepared to smile. When you get to work kindly place your bowl in the corner of your desk or work space with an "Eat Me" sign. Before you know it that candy will be gone and the temptation of indulging in the entire bag will go away with it.